There may be no greater way to find balance in this mad mad mad mad world than to stand on the banks of a river in July with the sun winking at you from the horizon. Fishing rod in hand, you take that first step into the water and the day begins. There are fish to be had, sights to be seen and, of course, the thrill of entering an environment that is so alien to your everyday, yet, so inviting. Listen to this broadcast or download “Angling, a lost art for survival and the soul” in this player! That is the allure and the romance of angling. Reading Izaak Walton (because of his last name) and Henry David Thoreau has taught me about angling and nature. When I say angling I mean the true inhalation of the act. 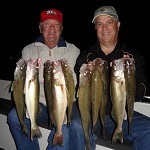 Not only fishing but experience the sights and the sounds of nature. Immersing yourself as deeply as the baits you cast, in the world around you. That is angling, in its purest form. Greater a teacher than any writer is the experience itself. For many, fishing happens on a boat, it happens on a bank or it happens off a pier. Now, the act of fishing is quite therapeutic in any form. Ripping buzz baits through weeds or soaking heavy weights for spot, its all fishing and it takes us away from the monotony of such long life. Still, there is something very different about becoming part of an environment and exploring it by foot. Wading deep pools and walking through woods to find the very best spots. This is how you get the lasting and powerful effects of angling to penetrate deep into your soul. Its about the connection. You just cannot experience that same connection from a boat or a bank. Again, the truth about angling is that it is meant to immerse you in the natural world. While fishing the city waters of the James River in Virginia is how I spend much of my time, I still learn much about survival. I learn about the wildlife and the natural foods in my area. I learn about those people who live around me, as well. There is another level. One that will truly test my survival skills. Its when I head deep into the mountains to chase native trout. This requires attention to navigation as well as managing much more dangerous wildlife than a blue heron. Some trips into Shenandoah are best when they feature a nightcap. The hikes can be arduous and fishing a little before bed and then again in the morning is the best way to enjoy them. In an age where we are constantly seeking out happiness, angling can be the answer. For me happiness has been most often found covered in weeds and mud in that heart palpating moment after releasing a nice fish. Consider another Walton’s advice on the pursuit of happiness. Previous: Previous post: Changes are a Coming? Next: Next post: The Art of Vehicle Preparedness!